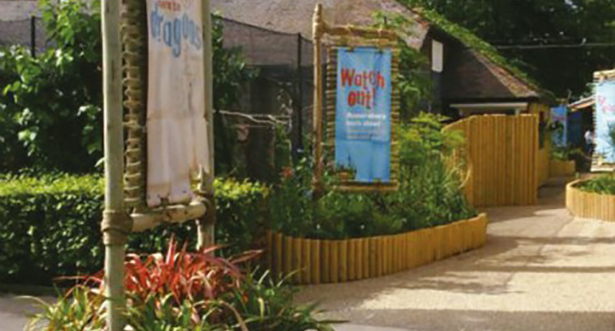 To develop signposts for London Zoo as part of the exhibit interpretation for a pair of rare Indonesian Komodo dragons. The signposts had to be in keeping with the feel of the zoo and help provide an impression of an Indonesian island, where dragons live in the wild. 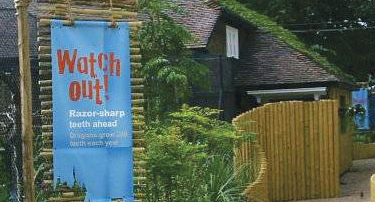 The signposts needed to line a narrow pathway to the dragons’ lair and support large banners; these would warn visitors of the dragons’ fearsome behaviour as they approached the exhibit. A tall, robust, rustic signpost, which was developed in authentic eucalyptus, bound with natural, thick rope. The signpost could be seen from some distance and the natural feel of the timber and hand-woven rope meant that it blended in perfectly with the landscaping.